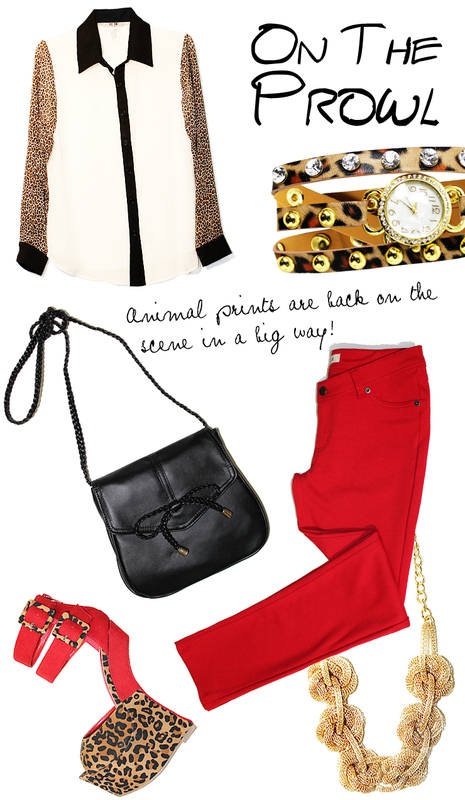 With fall's biggest fashion message being "Make A Statement" it's a no brainer animal prints are popping up everywhere. The ferocious feline patterns do pack a punch. The versatile print goes with virtually every color and can be easily incorporated into any wardrobe. Above we went all out coordinating a leopard contrast sleeve button up with leopard print shoes and wrap-around watch. With such bold pairings we kept the surrounding pieces basic: black cross-body bag, red knit jeggings and a short gold chain.